On Thursday 25th June 2015 The Culpeper in Spitalfields launches its Rooftop Bar, Grill and Greenhouse, the third phase of the restoration of the old Victorian pub by owners Nico Treguer, Gareth Roberts and Bash Redford. Sitting proudly atop the Victorian pub, the rooftop has its own bar serving signature cocktails, and a bespoke grill designed by Mark Parr of the London Log Company. A simple menu serving cuts of meat from the Ginger Pig butchers and salads from the garden will be served for lunch and dinner, using fresh herbs from the garden. And, best of all, the spacious greenhouse offers protection from the elements so guests can enjoy the botanical rooftop space all year round. What are the best dining options near The Culpeper: Rooftop Bar, Grill and Greenhouse London? The Culpeper: Rooftop Bar, Grill and Greenhouse gyms, sporting activities, health & beauty and fitness. 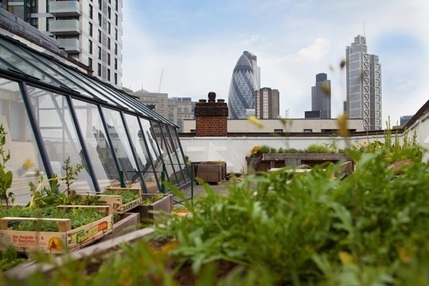 The best pubs near London The Culpeper: Rooftop Bar, Grill and Greenhouse. The Culpeper: Rooftop Bar, Grill and Greenhouse clubs, bars, cabaret nights, casinos and interesting nightlife. Where to have your meeting, conference, exhibition, private dining or training course near The Culpeper: Rooftop Bar, Grill and Greenhouse. From cheap budget hotels to luxury 5 star suites see our deals for The Culpeper hotels, including Grange City Hotel London from 96% off.